James Seward's paintings bring to life the teachings of Jesus. In this beautiful scene, the tradition of that time was for the lowest servant in the household to wash the feet of all guests as a courtesy in a hot and dusty land. Even though Lord and Saviour, Jesus assumed the part of the servant, in spite of Peter's protests. Jesus' humble act showed His disciples that, although they were bearers of the Gospel, they were to love and serve all. Jesus' loving example applies to us today. John 13: 12-17, "...Know ye what I have done to you? Ye call me Master and Lord, and ye say well, for so I am. 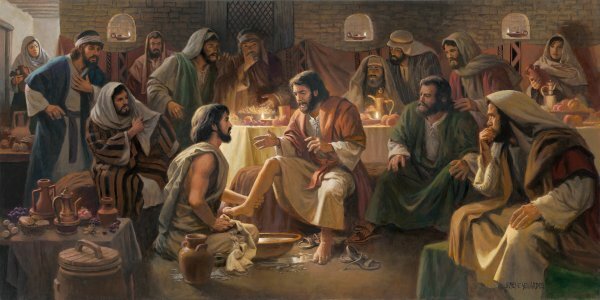 If I, then, your Lord and Master, have washed your feet, ye also ought to wash one another's feet. For I have given you an example, that ye should do as I have done unto you."